San Francisco’s aggressive approach to removing tent camps may be a preview of what’s to come in Seattle. The two cities have similar progressive politics, tech booms and growing wealth gaps. SAN FRANCISCO — Two years ago, the street under Highway 101, cutting through the heart of this Bay Area city, was lined with hundreds of tents sheltering homeless people. But on a recent morning, there were only a handful. 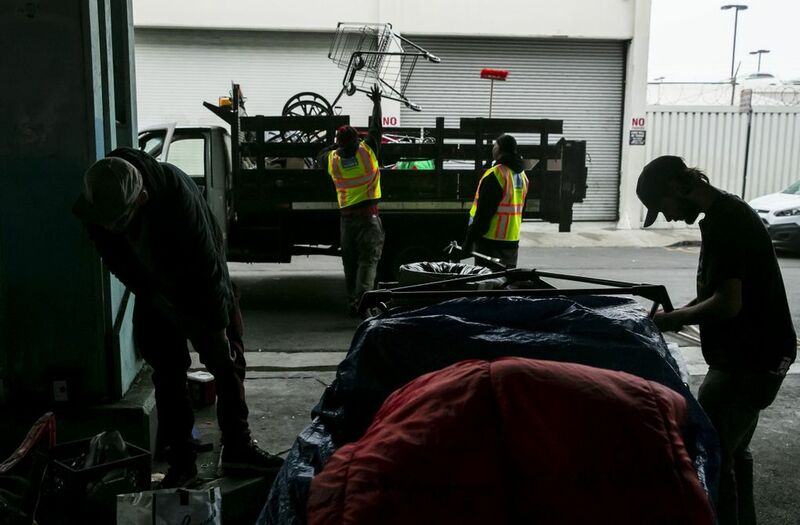 Instead, Guillermo Perez and the San Francisco Public Works crew he leads, which cleans encampment “hot spots” all over the city, stumbled across something he’d never seen: a motorized cart, like those used to carry an injured football player off the field, parked next to three people who’d camped on the sidewalk overnight. The young couple who claimed the football cart, Kolby and Cara, had no tent visible, just a few tarps and a pile of their things. Beside them was another man with a large bin. Everything was on wheels. If you are homeless in San Francisco, mobility is critical these days, as city leaders demand that tent camps, large and small, be cleared from the streets. And, on the whole, the city has achieved that goal. As of June, there were no encampments of 20 or more tents or structures in a city infamous for its homeless camps. Overall, the number of tents has been cut in half since 2016. That strategy responds to increasing frustration among residents and city and business leaders, who said camps posed serious health risks and incubated crime. 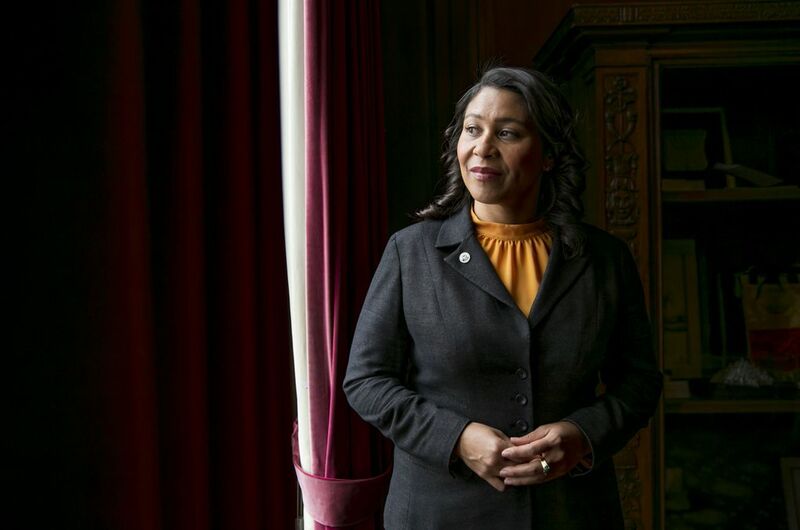 The past three San Francisco mayors, including new Mayor London Breed, have prioritized cracking down on the encampments — something Seattle leaders have tiptoed around. The aggressive path San Francisco has taken may be a preview of what’s to come in Seattle — the two cities twinned by progressive politics, tech booms and growing wealth gaps. Seattle has recently quickened the pace of encampment removals, as Mayor Jenny Durkan faces increasing pressure to stem the homeless crisis. San Francisco’s recent experience shows the consequences. Homeless advocates argue the strategy doesn’t end homelessness, but instead scatters people, leaving them with insufficient access to shelter and affordable housing. People often keep tents up just overnight, so they’re less likely to be spotted. 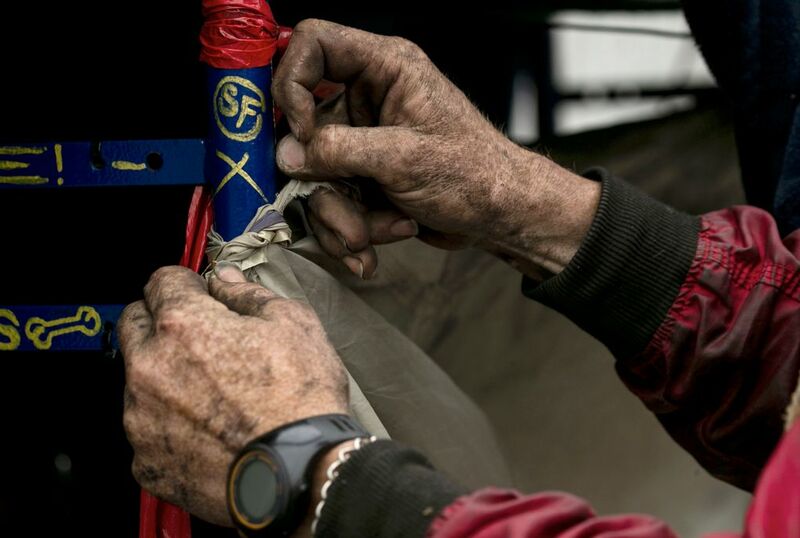 effort to connect people living in large camps to shelter and other resources. Almost every homeless person in San Francisco recently interviewed by The Seattle Times said they were constantly told to move. It used to be every two weeks, said Cara in a rapid, barely audible clip. Now it’s nearly every day. That, San Francisco officials say, is largely the point. “We can’t let up,” said Breed, who was elected in June, becoming the city’s first black female mayor. That’s where the daily street cleans come in. Perez’s team includes two pressure washers and steam cleaners, blasting sidewalks with boiling hot water and lemony Pine-Sol. 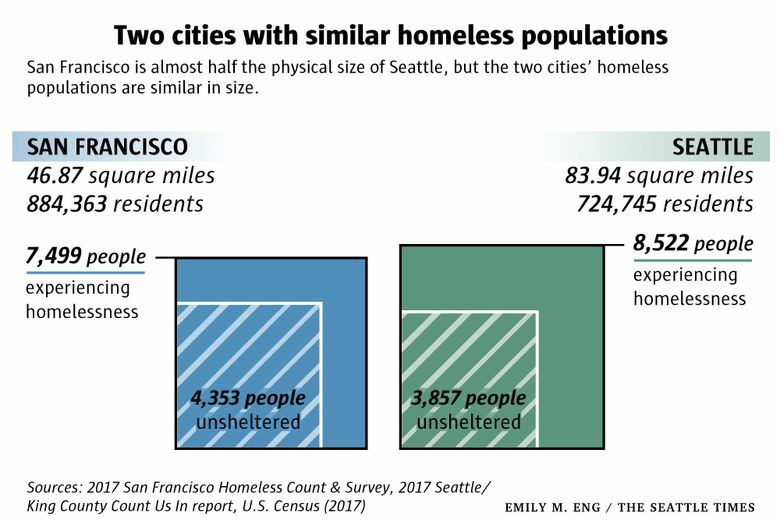 Homelessness has long been an issue in San Francisco that — due to the city’s compactness — touches almost everyone who lives there. Imagine squeezing Seattle into a city roughly half its physical size, and where the property values are almost twice as high. 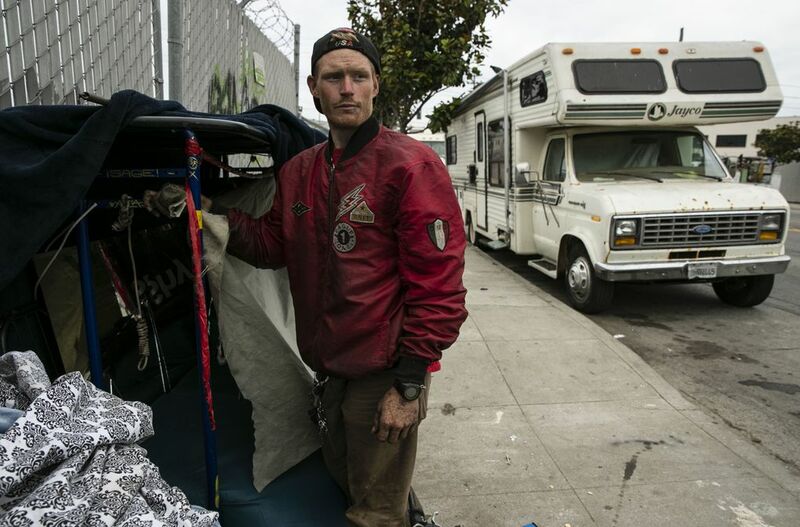 San Francisco’s tech and real-estate development boom has exacerbated that tension, wiping out warehouses and vacant lots where homeless people used to sleep, at the same time ushering in enormous wealth. This has pushed homeless people, and their struggles, into the public eye in a way they previously weren’t. That coincided with rising opiate use and a mental-health system that ranks by some measures slightly worse than Washington’s, according to a report from the nonprofit Mental Health America. Locals often identify the city’s hosting of the 2016 Super Bowl as a critical juncture, when tents started to become more ubiquitous and the city started to push for more cleanups. 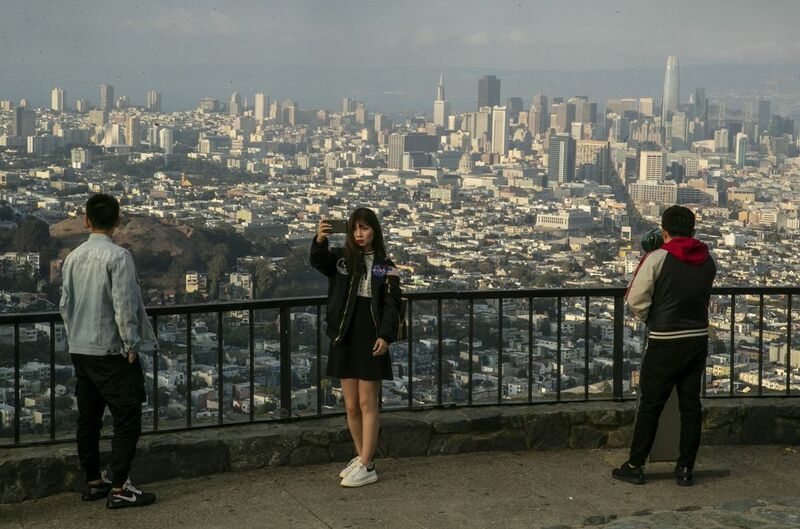 The city’s tourism industry started to be impacted, said Jim Lazarus, the San Francisco Chamber of Commerce’s senior vice president of public policy, and there was a realization at City Hall that the problem had gotten to a breaking point. Breed echoed that frustration in her campaign. She embraced more progressive ideas — support for safe drug-injection sites and more housing — but also took harder-line stances for cleaner streets and more forced treatment for people with serious mental-health issues. And unlike in Seattle, where a contingent on the City Council vocally opposes “sweeps,” San Francisco’s Board of Supervisors is not as queasy about removing large encampments as long as people are offered shelter, Lazarus said. Elected officials are reflecting the compassion fatigue in the community, said Dr. Margot Kushel, director of the University of California San Francisco Center for Vulnerable Populations. She has concerns about the camp removals. “I think there are a lot of people who don’t see the sweeps as a bad thing because they see it as a necessary evil,” said Kushel, who like many homeless experts believes housing is the best way to solve the crisis. The whiteboard in Jeff Kositsky’s office in the city’s Department of Homelessness and Supportive Housing features a big goal: Reduce the city’s one-night homeless count of 7,500 by 30 percent in the next five years. It’s a big swing considering those numbers have stayed fairly flat in San Francisco since at least 2013. The department Kositsky directs is only two years old, created to unite some 400 homelessness-services contracts scattered across eight city agencies under one umbrella — something Seattle still has not done. Kositsky is no-nonsense about the work and his belief that it must be done with the needs of homeless people in mind. 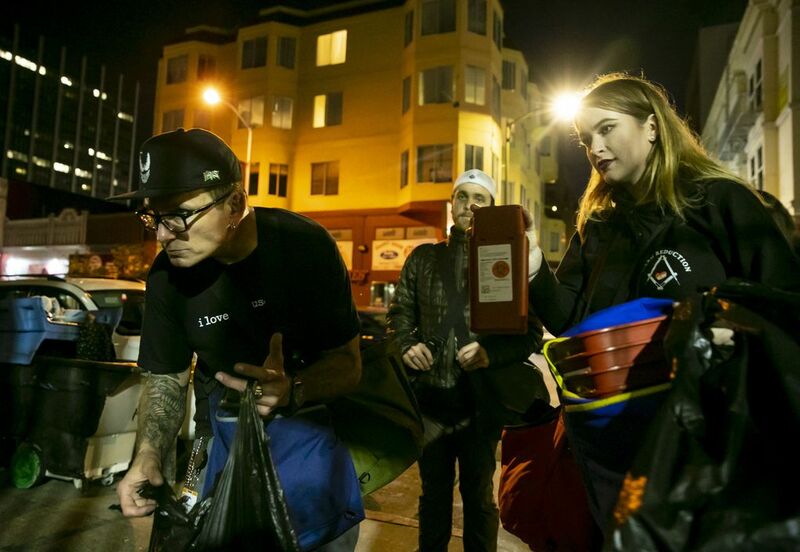 To that end, San Francisco has three teams, totaling 70 people, that focus on homeless people living outside. 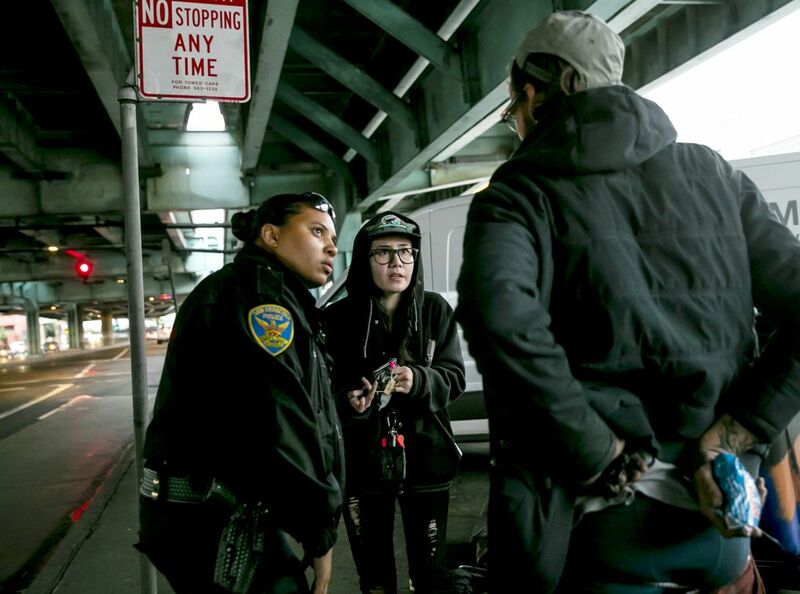 A Homeless Outreach Team works with people who are homeless in the city at large, and includes case managers who link clients to services but does not include police officers. A smaller group of four focuses exclusively on worrisome, large encampments of six tents or more, which Kositsky calls “incredibly unhealthy places” for them to live. After a few weeks of offering services and shelter to everyone living there, Public Works crews start the cleanup. Seattle roughly copied the model with its 22-person Navigation Team, soon to grow to 30 people. It includes police officers and does outreach at all encampments, not just those slated for a cleanup. It is stretched thin. San Francisco also operates its homeless-related services out of a command center similar to Seattle’s. But in San Francisco, a dispatch line runs directly to the office so people can call seven days a week to ask someone be sent to assess a homeless person. Mayor Breed herself regularly calls to report tents. 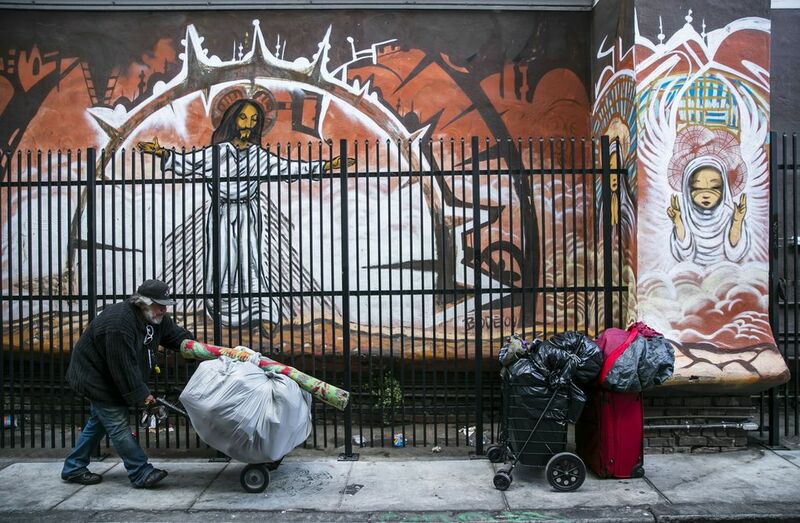 Overall, the budget for San Francisco’s homeless department’s is $284.5 million. In addition, Public Works spends $15.2 million on the cleanup effort. Seattle’s homelessness response budget is about $86.7 million, according to a recent City Council committee report. Getting these systems in place in San Francisco took time. The business community had to be patient. But at what cost have those tents disappeared? And to what effect? Of the roughly 1,200 people who lived in camps removed by the Encampment Resolution Team, around 300 of them — 25 percent — went into permanent housing, according to Kositsky’s department. That’s similar to the success rate the city sees across its homeless programs, Kositsky said. The city is not sure what happened to the rest but hopes researchers will study who stays outside and why. Meanwhile, more than 1,000 adults were on the waiting list for shelter as of mid-September. 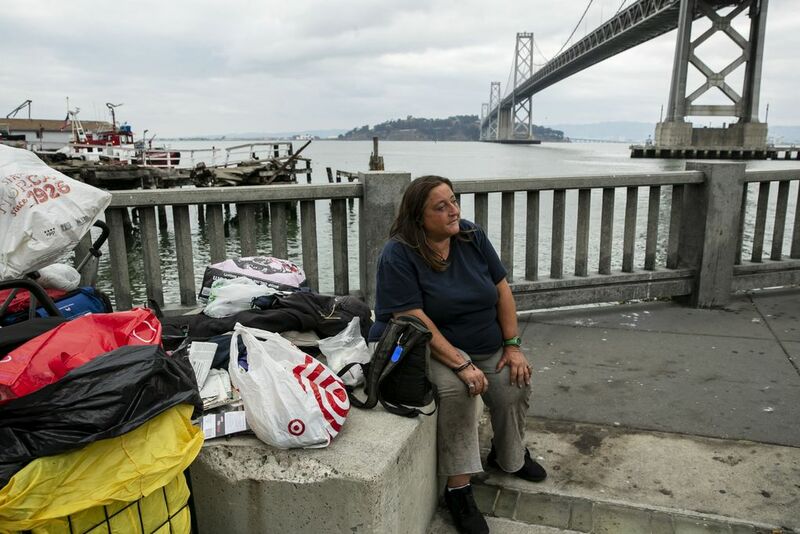 Across San Francisco Bay in Alameda County, which includes Oakland, the homeless population has increased and some staff believe more homeless people are coming from San Francisco, said Elaine de Coligny, executive director of the county’s homeless services coordinating agency. She’s waiting to see if next year’s homeless count supports that theory. 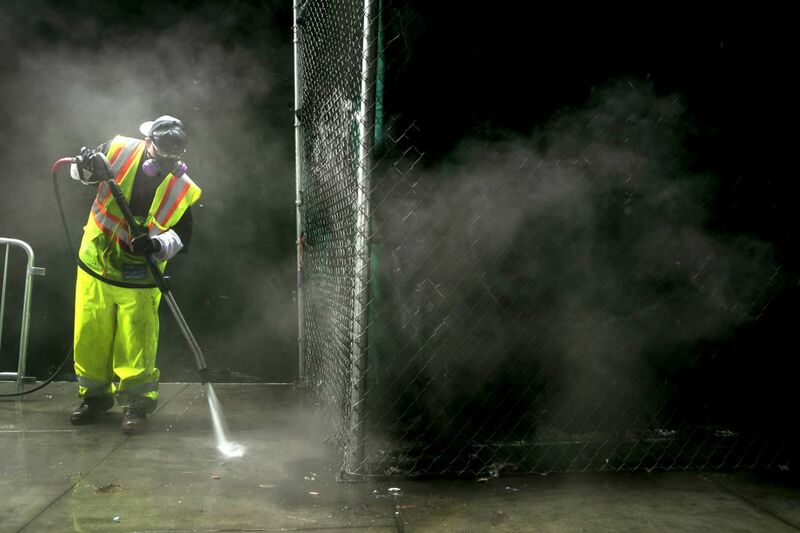 In San Francisco, people are kept constantly on the move by Public Works’ cleanup teams, which do not include outreach workers. Police, however, are usually present to protect the crews. That’s a major concern to homeless-service providers and advocates, who fear enforcement has taken precedence over outreach. 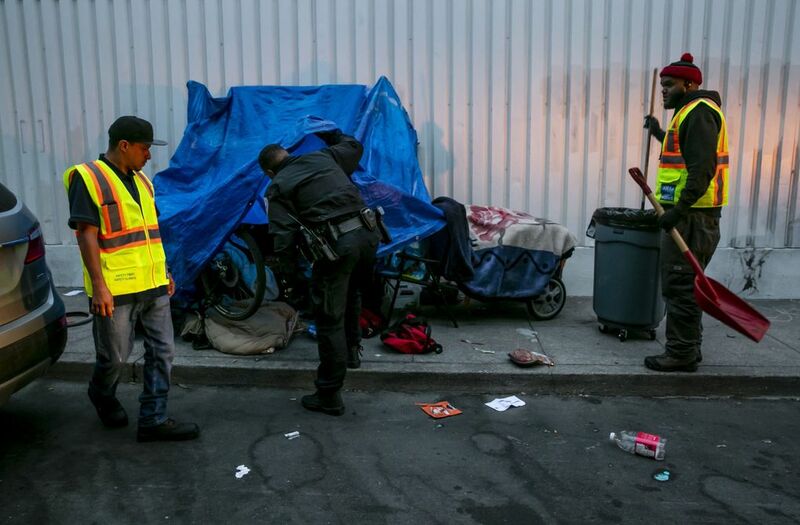 Public Works staff and police officers are “not social workers,” said Kelley Cutler, human rights organizer for San Francisco’s Coalition on Homelessness. “We’ve been scrambling,” said Krystle Erickson, who once lived in a large encampment. 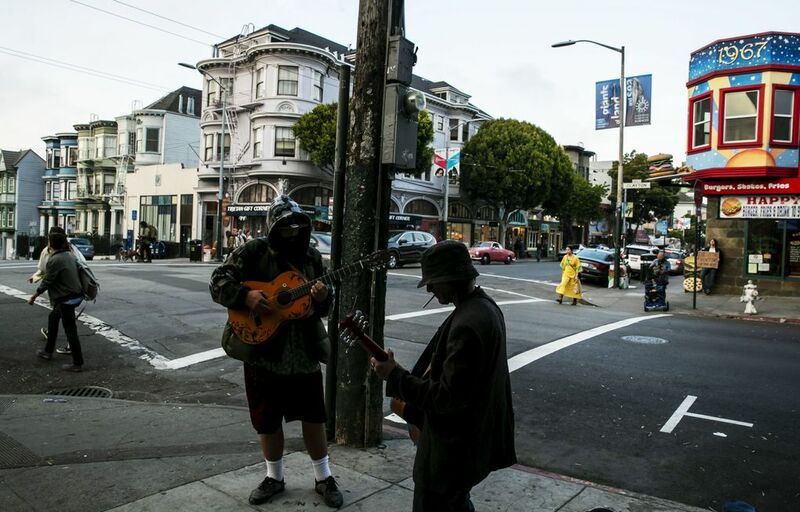 On a recent Wednesday, after being told to move several times, she and friend James Mister had stopped outside a wholesale herb and spice store in the Mission District. Her belongings were piled on a Costco shopping cart and a baby stroller she’d found the previous day. Her gray cat, Buku, was curled in a pet carrier. But soon, Eddy Rose, the store manager, asked them to move along. It’s his job in the morning to clear and sweep the street, so trucks can get in and out of the store’s warehouse doors. “If there’s encampments, that makes it difficult,” he said. Erickson and Mister moved a few blocks away, no argument. The pair also had beds in a nearby shelter, called a Navigation Center, which offers an array of services and are designed for people historically resistant to shelters, a model Seattle also copied. 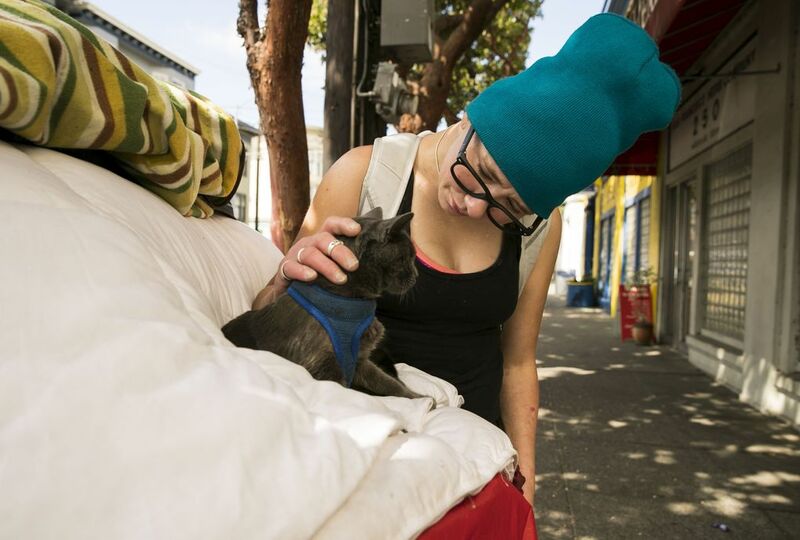 They don’t stay there every night, which is not uncommon among people transitioning to living inside; the center also recently kicked out Erickson’s friend Veronica, so sometimes she stays with her on the streets. 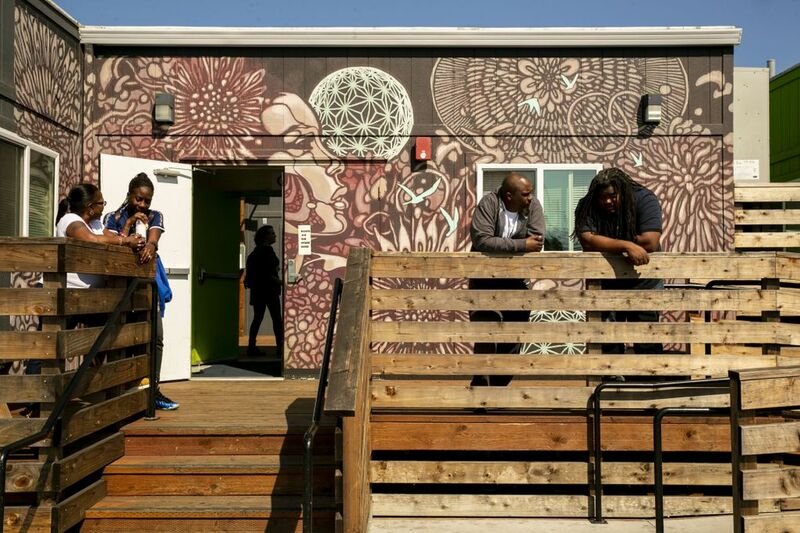 But San Francisco — which will have five Navigation Centers by year’s end compared to Seattle’s one — has put time restrictions on almost half the beds, a reflection of the city’s limited resources. Erickson is only guaranteed 30 days of shelter. Other beds have seven-day limits, restrictions that Seattle does not impose. Kositsky argues these stays give people a crucial respite from the street. About 1,370 people have had a “successful exit” from the Navigation Centers as of January. 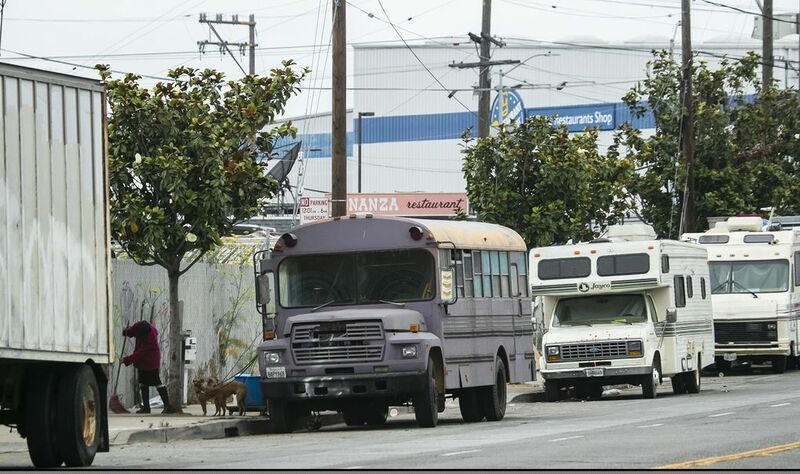 Of them, almost 66 percent left through the city’s Homeward Bound program, which essentially buses people out of San Francisco, connecting them with friends or family in other cities or states. For their part, Erickson and Mister are exhausted with street life, too, and the hassle of constantly moving their things. Erickson, 38, is battling heroin addiction; Mister has been outside 15 years. “I just keep wanting it to be over,” Mister said. And this is exactly what Mayor Breed hopes will happen — that people will tire of the constant moving. “We can’t control what people decide to do. What we can try and do is continue to stay on top of it and to basically get to a point where … people say, ‘OK, fine, I’ll accept the help,’ ” Breed said. But as surely as fog rolls over the San Francisco hills, homeless people are still all over the city even with the clampdown on tents: from the Haight-Ashbury, where buskers sing on street corners, to the hidden industrial areas of Bayview, where increasingly vehicles used as homes park along the streets. Many see it as an intractable part of life here, a fixture on the daily commute. Sara Caldwell and Jerrin Lawian regularly saw tents while walking into their office on the edge of the Mission District. The city recently cleaned up the area, but both expect the tents to return. This is the question for San Francisco and Seattle: How does a city address homelessness beyond encampments? On this, both cities share political battles: San Francisco is planning to move forward with safe drug-injection sites, something Seattle and King County leaders support but have yet to set up. Public drug use is the major problem in San Francisco today, and it’s not entirely a homeless one. A bill legalizing the sites has passed the state Legislature and awaits the governor’s signature. San Francisco is also locked in a battle over another familiar question, whether businesses should have to pay for homeless services. Similar to Seattle’s now-defunct head tax, a proposition on San Francisco’s November ballot would levy a tax on businesses with at least $50 million in annual revenue to raise about $300 million a year for housing and services for homeless people. Even with more new housing in the pipeline, Kositsky, the city’s homeless director, is blunt about realities going forward. “We can’t offer everyone everything they want, but what we should be trying to do is offering everybody something that’s going to provide some relief from their situation,” he said. 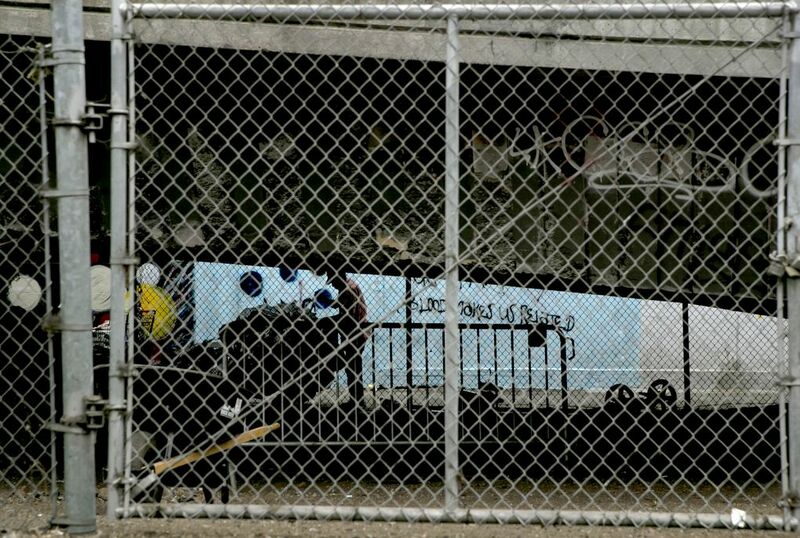 It’s not clear what that is, however, for Kolby and Cara, the couple with the football cart that Perez and his crew encountered under Highway 101. It was after 6 a.m. now, the city was waking up and crews were waiting to clean. The couple had to get going. “Does it move?” Perez asked them, referring to the cart. Reverse didn’t work, but forward did. The couple pulled away and around the corner.